How many times have you gotten irritated because you either could not find the grammar or punctuation rule you needed or you could not keep the page flat as you attempted to put the instruction into practice? Rest assured, these days are over as soon as you put the Writer’s Digest Grammar Reference book to work on your desk! 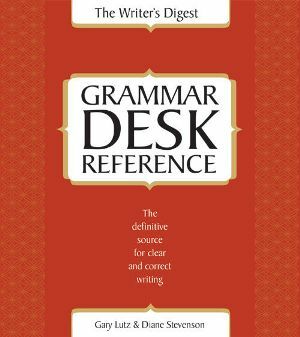 The Writer’s Digest Grammar Desk Reference is the comprehensive resource on grammar and usage, a necessity for every writer’s desk. It presents balanced instruction and real-world examples that will ensure professional and flawless work on every occasion. A comprehensive subject guide provides ease of use, and thorough discussions address such issues as punctuation, sentence structure, parts of speech and much more. The book is dived into four parts and has 29 chapters, in addition to a subject guide and an excellent index. Each chapter contains rules, conventions and instructions with simple, clear and appropriate examples. There are sections on common errors and how to avoid them. Part I (Grammar: An Overview) deals with nouns, verbs, modifiers and other parts of speech, phrases, and clauses. The second part— Grammar: Rules, Conventions, and Errors to Avoid—deals with subject-verb agreement, errors in the use of verbs, parallelism, errors in modification (misplaced, dangling, and ambiguous modifiers), personal pronouns, pronoun-antecedent agreement, reference of pronouns, faulty comparisons, faulty predication, mishandled ellipitical constructions, problems with ‘that’, etc. Part III (Punctuation: Rules, Conventions, and Errors to Avoid) gives a comprehensive treatment on punctuation marks and their usage. The nine chapters in this part cover terminal punctuation marks, comma, colon and semicolon, parentheses, dashes, apostrophe, question marks, specialized punctuation marks, hyphen, etc. There is also has a chapter that illustrates how to punctuate compound, complex, and compound-complex sentences. The fourth part (Mechanics and Usage) deals with issues like capitalization, presentation of numbers, abbreviations, etc. The glossary of commonly misused words is an excellent source to learn the words that one should be careful about while writing. The Writer’s Digest Grammar Desk Reference is a practical, comprehensive and accessible book. It fills a need in the grammar/punctuation reference book market offering correct grammar instruction that is reader-friendly, fun to read, and easy-to-understand. A must have for every writer.